The Purple Rose of Cairo. Orion Pictures Corporation 1985. I don’t think I’ve seen a Woody Allen movie he didn’t star in yet. Well, depending on how much What’s Up, Tiger Lilly? counts.Oddly, this is a metafictional fantasy about crossing the barrier between film and reality, but it feels more traditional than I expect from Allen. I’m expecting a more traditional performance from Jeff Daniels, too, despite the fact that he’s a fictional character who’s walked off the silver screen. One thing I’m uncertain about in my expectations is the inner movie’s style. I’m imagining a golden age of Hollywood feel, but that was the 40s at the earliest, and this movie is set in the 30s. I’m much less familiar with films of the 30s. Cecilia, an overworked waitress in an abusive marriage, much like many in the Great Depression, finds her escape in the movies. 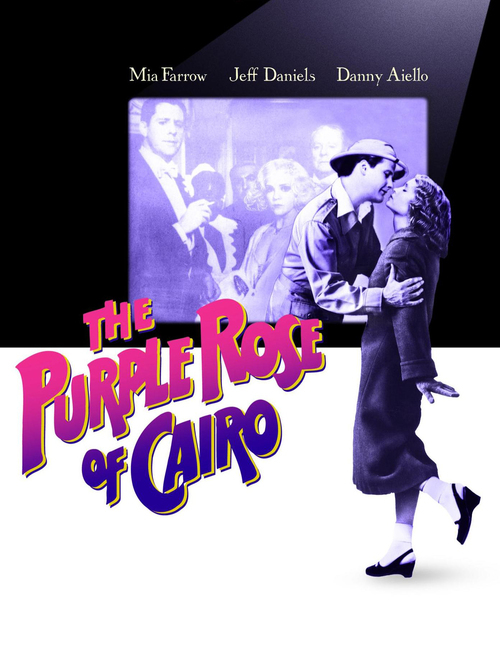 When the romantic comedy The Purple Rose of Cairo opens in her town, it’s such a delightful picture that she sees it several times, to the point that major character Tom Baxter, archaeologist-adventurer, stops in the middle of the show to comment on how much he’s seen her and how lovely she is, and walks off the screen to meet her. This throws things into chaos on both sides of the screen. Without Tom, the rest of the characters can do nothing but sit around fuming about neither being able to continue the plot nor escape the screen themselves, the theater loses money from nobody wanting to see the characters sitting around, and the Hollywood executives responsible for the film are terrified of the legal repercussions of characters entering the real world. Tom’s actor, Gil Shepherd, also comes to town, concerned that having a doppelganger roaming the world would ruin his career, and will do anything to convince Tom to return to the film. Cecilia’s husband Monk isn’t very keen on her new boyfriend either. Daniels is very much playing to his strengths. Tom is not only as perfectly charming and sincere as he was written and performed to be, he’s also filled with wonder and naivete about the world that Daniels plays very well. Mia Farrow seems almost along for the ride, though that’s more to do with her character being pulled several directions at once, so she has little more to do but react to it all. There are two key effects this movie employs. The transition between the real and the cinematic is simple, but effective. There are some problems with the way it might look from other angles, but the angles used hide it well. The other effect is in the scenes where Tom and Gil meet, which seemed so flawless to me that I’m almost ready to believe Jeff Daniels is really a pair of twins. This film is about the collision of fantasy and reality, and manages to explore it in ways that are fresh to me as someone well-versed in metafictional stories like Six Characters in Search of an Author, Last Action Hero, and the Thursday Next series of novels. There are some ideas about reality presented as harder absolutes than I’m comfortable with, for example, implying that a man of strong commitment and moral character like Tom simply doesn’t exist in flesh and blood, but it serves the point that fiction is idealized to an impossible degree. And in the end, the questions raised about fantasy and reality receive answers in the way they must. Watch this movie: as a romance, as a melancholy comedy, as a discussion of fantasy, take your pick. Don’t watch this movie: if you won’t be satisfied with any surprises but the ones you always expect.